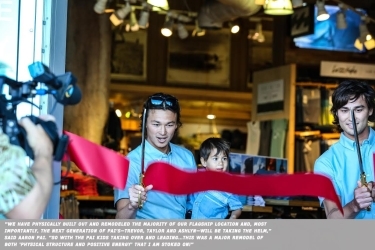 HUNTINGTON BEACH, CALIF. – Amidst a standing room only crowd of surf industry royalty, city royalty, family, friends and past and present employees, Huntington Surf & Sport celebrated its Grand Opening on Wednesday, May 25 at the corner of PCH and Main Streets in Surf City USA. Among the dozens of dignitaries in attendance were Vans GM of North America Doug Palladini, Firewire Surfboards President Mark Price, Duke’s GM Brett Barnes, Peter “PT” Townend and Vans’ founder Steven Van Doren who was serving breakfast to all attendees. Luminaries included Stance President John Wilson, Reef President Jeff Moore, O’Neill’s Steve Ward and Pat O’Neill, former Surfing Magazine Publisher Bob Mignogna, Volcom President Kevin Meehan, Salty Crew Co-Founder Jared Lane and former professional surfers Taylor Knox and Jeff Deffenbaugh. City of Huntington Beach royalty included Robert Handy, Chief of Police, Mike Eich, Junior Lifeguard Chief, and Mike Baumgartner, Lifeguard Chief. Special guest speakers included Hurley founder, Bob Hurley, legendary Huntington Beach High School surf team coach, Andy Vendone, and the first employee that Aaron Pai hired after purchasing HSS in 1979, Greg Osthus. Hurley spoke at length about how HSS has captured the essence of the sport and acts as a “curator” for all generations of surfers. He also confirmed that HSS was the first dealer for Hurley-branded surfboards, with Aaron Pai fronting him $2,400 for eight surfboards in 1979; giving him free creative reign. Verdone discussed the many surf trips that he and Aaron have taken to the world’s most exotic locations, and how HSS has cultivated a “family” atmosphere that makes the store welcoming for everyone. Osthus shared several stories (past, present and future) about how Aaron constantly pushes the retail envelope and continues to evolve HSS into the premier specialty retail destination. Greg mentioned how he was the young surf rat wanting a job back then and his 12 year-old son represents the new generation of kids that will be taking over soon. The ceremony concluded with the cutting of three red ribbons at the store’s main entrance representing the past, present and future of HSS. Aaron’s mother, who originally loaned him the money to purchase the store, cut the first ribbon representing the past. Aaron cut the second ribbon representing the present. And Aaron’s sons Taylor and Trevor cut the third ribbon representing the future of HSS. And with that, the store was opened to the public for all the surf industry, surfing community, friends and family to enjoy and see.